The cliche, windy Wellington, played out. Hurricane force gusts of wind buffeted us as we walked home from dining out. 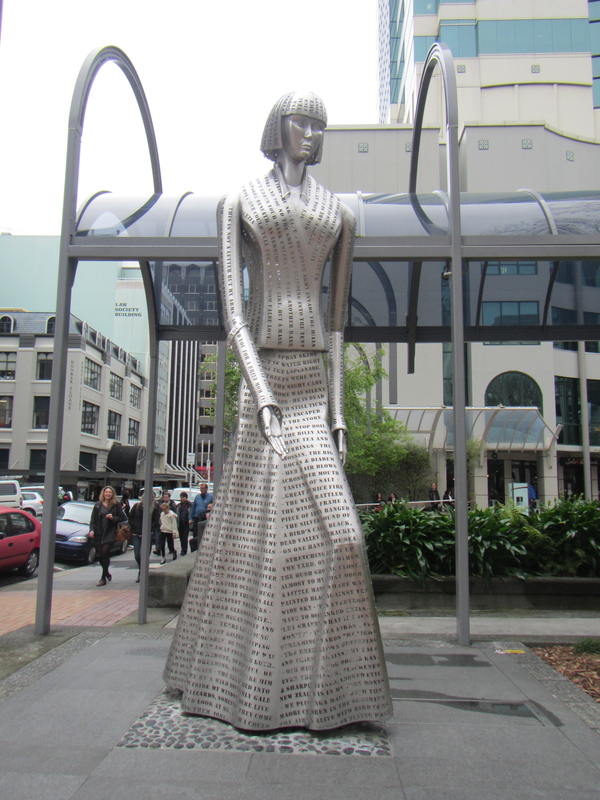 However, Wellington is not so easily dismissed. 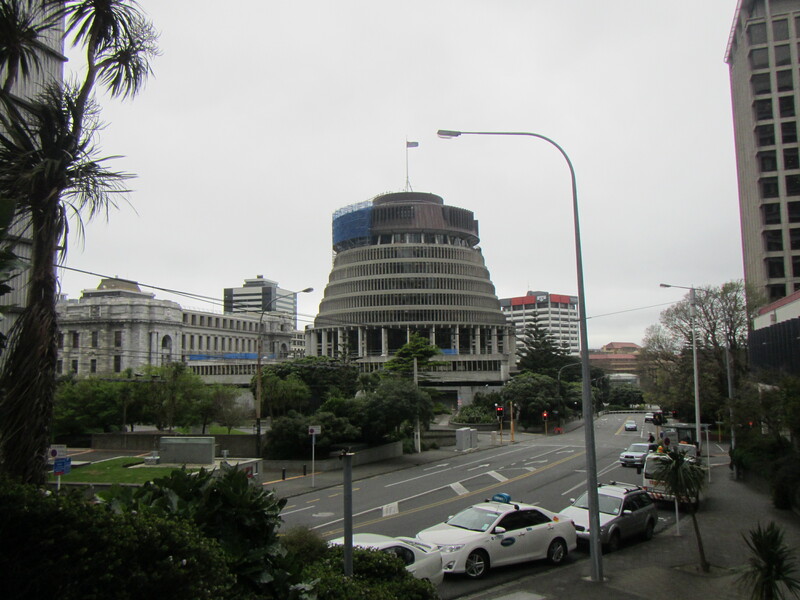 As the capital city, it has many paradoxes–just like New Zealand. They celebrate Katherine Mansfield for largely inventing the modern short story–something she did while living in Europe. Wellington hosts some wildly creative people, including WETA studios and the World of Wearable Art–and the national government. They have a beautiful botanical garden with a lush history of plants–and a freeway that rips right through the heart of the city. It makes for a stimulating place to visit. There is no shortage of great coffee and restaurants. Just be sure to carry a waterproof jacket. And best not to watch your plane land in the airport (eyes shut tight!). Do you remember the ad, “Coo coo for Coco Puffs.” I could not help but think of that when I listened to my reaction to the penguin exhibit at Kelly Tarlton’s in Mission Bay, Auckland. Maybe it was too many days of squinting to see penguins in the wild. Maybe it was the penguins’ joy in swimming. I was a little kid again. 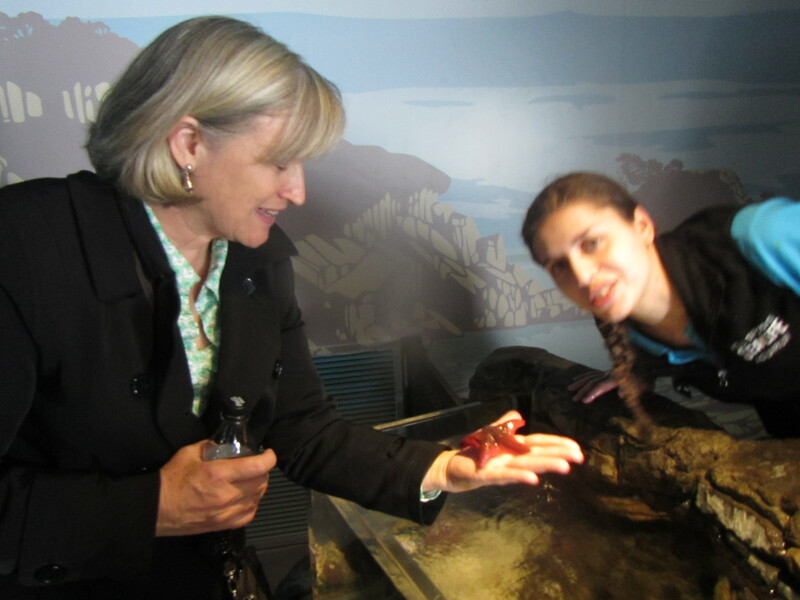 The five months I lived in St Heliers Bay I must have passed Kelly Tarlton’s Sealife Aquarium 5 times a week and I never visited. People gave me mixed signals. On the one hand, people were proud of Mr. Tarlton’s inventiveness and entrepreneurial spirit building a unique facility ahead of its time. On the other hand, people suggested it was a little cheesy. And then there is the whole objection of zoos or aquariums in general keeping animals in captivity. I enjoy a good zoo. Sometimes it is the only way we can observe species and appreciate the tremendous variety in creation. While I hope to get to Antarctica someday, it may be awhile before I can see gentoo and emperor penguins in their native habitat. What a thrill to observe them here. The admission price is reasonable ($36 NZ per adult; discounts on-line and with coupons) and there is much more to see than my funny penguins. I met Diana at the entrance. 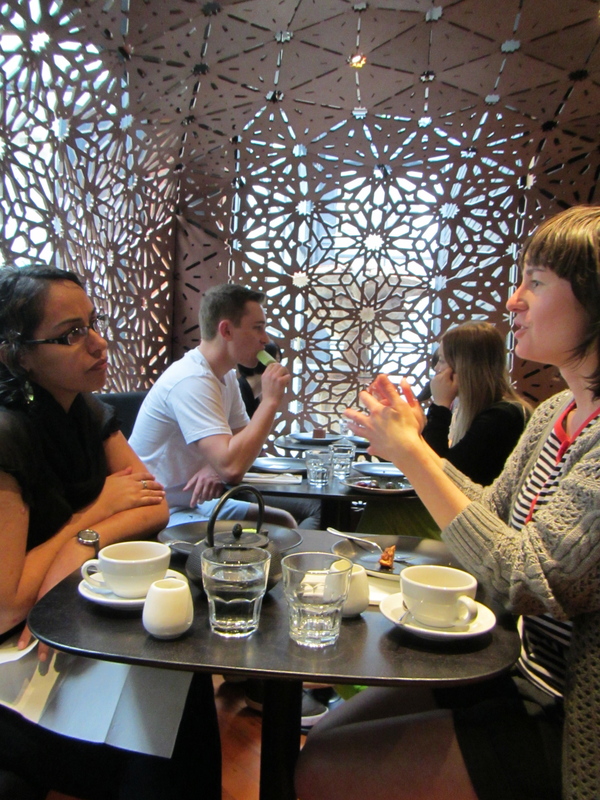 She is studying in NZ on a scholarship and we were introduced through our mutual friend Deb. 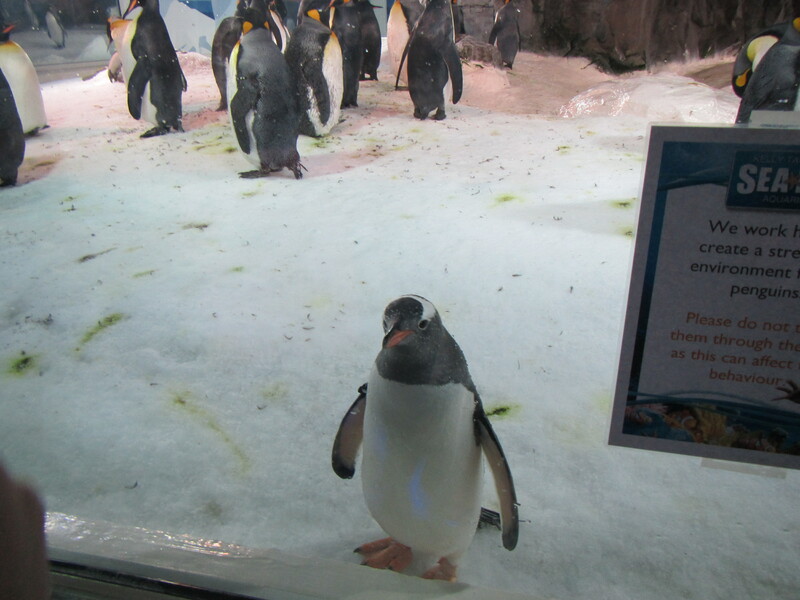 We bonded over this curious gentoo penguin who seemed genuinely interested in us. We giggled and ooohed and ahhhed through the rest of the aquarium exhibits, and lingered longest with the penguins. We both were drawn to the stingrays. They are graceful and exude calm. Yet, like so many paradoxes in the sea, they still have the ability to seriously hurt or kill you. There is a great tidal pool exhibit and a window where you can look out directly into the bay. The entire aquarium is like a giant optical illusion as it is built below the parking lot and you are below sea level the whole time. 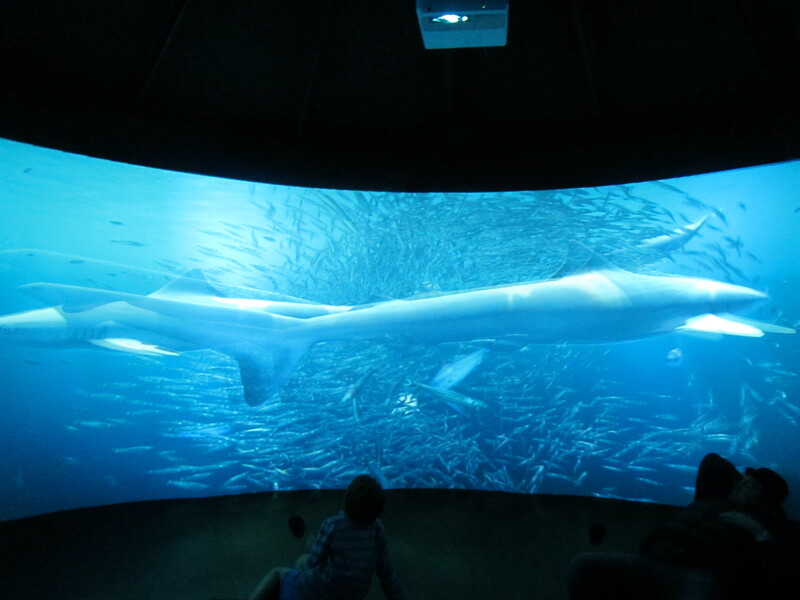 It was a fun afternoon and anyone with an ounce of curiosity and a smidgeon of child’s heart will enjoy Kelly Tarlton’s. 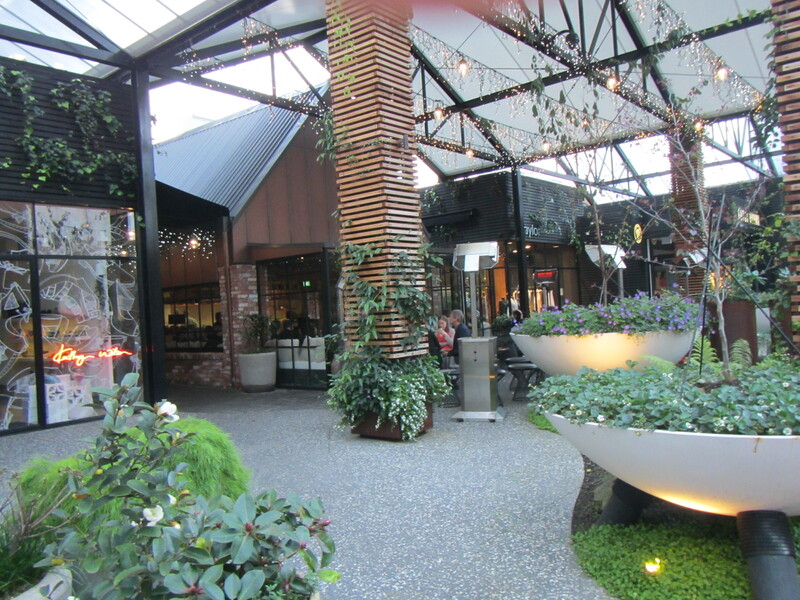 Called the secret dessert garden, it was easy to talk my friend Diana into trying a new desserts-only restaurant, Milse, in the Pavilions of Britomart in downtown Auckland. Another friend Beverley told me about Milse while we ate lunch at another of the restauranteur’s eateries (St. Heliers Bay Cafe and Bistro) These are all new additions since I was last in Auckland JUST 10 MONTHS AGO! The entrance to Milse is slightly hidden, just like the gate in the classic children’s book. 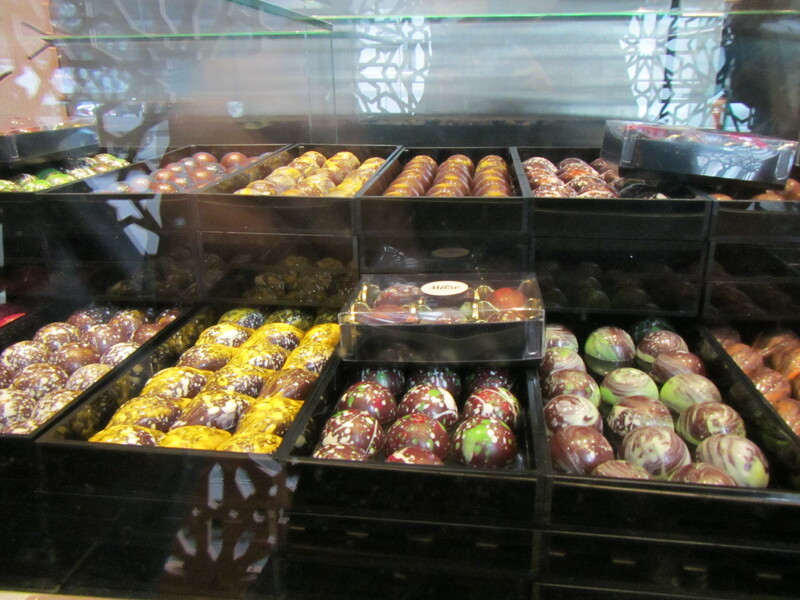 The front entrance is filled with cases of delectable chocolate and other desserts. There is a hostess station where you can buy your dessert to go. There are people waiting to be seated at one of the 5 or 6 small tables. We went early enough that we were seated promptly. The hostess led us past a bar where you could sit and eat divine desserts while watching the chefs create similar confections. Or you can sit in a cozy table that feels like the inside of a beehive. We decided to go for it! We ordered four different menu items and our eyes rolled back in our heads depending on our individual tastes. For Diana it was the pecan and honey tart. For me it was, well all of them, but especially the chocolate covered ice cream bar. 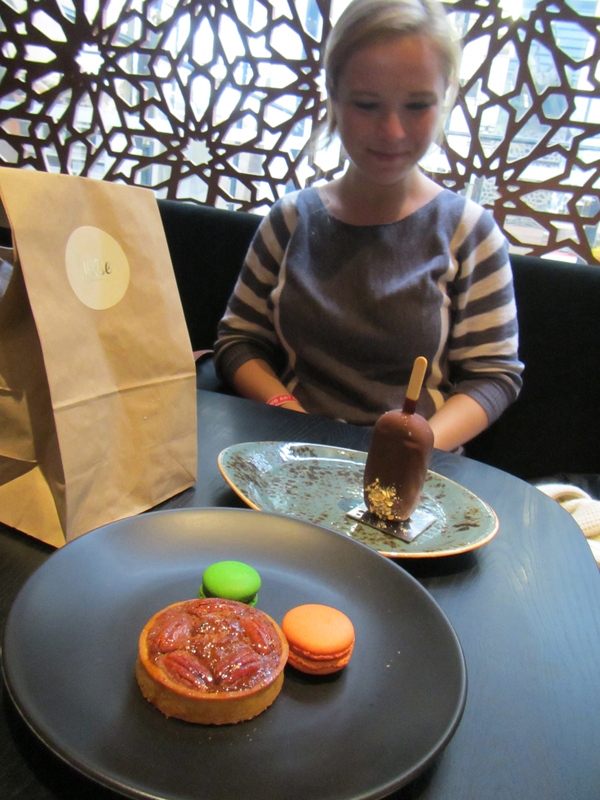 Diana admiring our selections before we devoured them! Forget my pledge to eat sugar free! This is just too amazing of a dining experience to pass up. 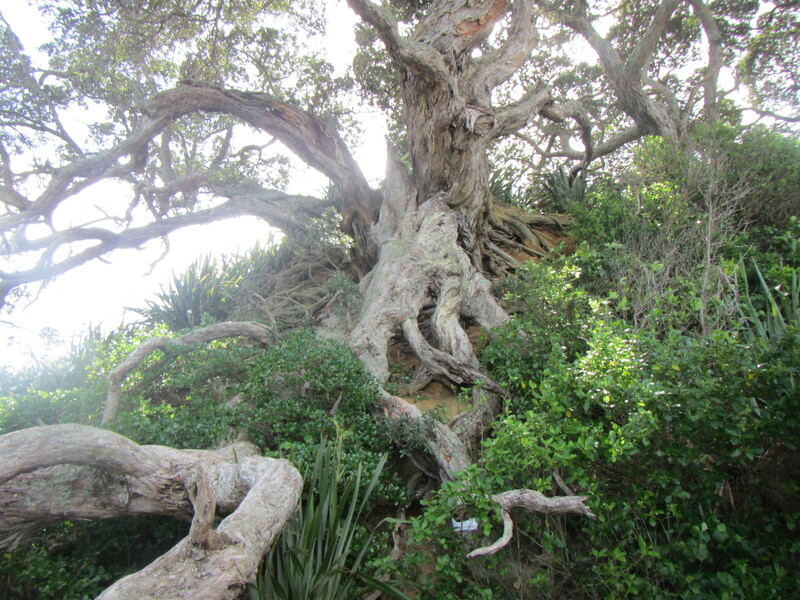 Just saying the name of the island is a delight: Tiri Tiri Matangi. It is an inspiring example of intentional habitat restoration and a testament to the 100,000 volunteers who have transformed it from an over-grazed sheep ranch into native bush with a dozen rare NZ birds. I read about it some time ago and finally managed to carve out the entire day you need to ferry from Auckland to enjoy this wonderful bird sanctuary. The ferry only leaves the Auckland harbor once a day at 9:00 a.m. and returns by 5:00 p.m. The cost per adult is $66 and there is no additional charge to enter the wildlife reserve. The ferry ride is comfortable depending on the weather, and I recommend, as in all outdoor NZ adventures, wearing layers and bringing a waterproof jacket. Volunteer guides sell maps of the island for $1 NZ and the money supports the restoration work. There are signposts on the island, but come on, you can give a $1 for a good cause and a better map! The key to the success of the island as a bird sanctuary is the removal of all predators. It made me giggle to think of checking my backpack for mice, but seriously, I would not want to be the jerk who brought a pest onto the island. Similarly you’ll be asked to take every scrap of trash out with you and to bring your lunch in a plastic container as a further pest precaution. Almost as soon as we left the dock and headed down the trail we came to the little blue penguin nests. One of the advantages of the reserve is that it provides ample opportunity for scientific study only a 75 minute ferry ride from the largest NZ city. I learned about the island from guidebooks and from reading Jacqueline Geurts’ book, The Ecology of Little Blue Penguins. She did her research on Tiri. We were able to see a blue penguin at rest by lifting the hatch. 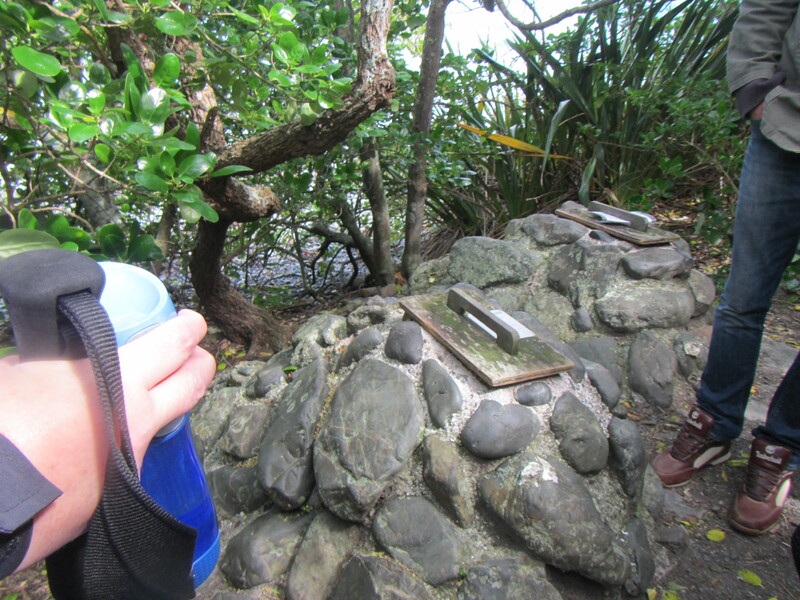 We continued on the hike and listened to the songs of various rare and endangered New Zealand birds. The restored bush was also lovely and it is outgrowing its “planted look”. 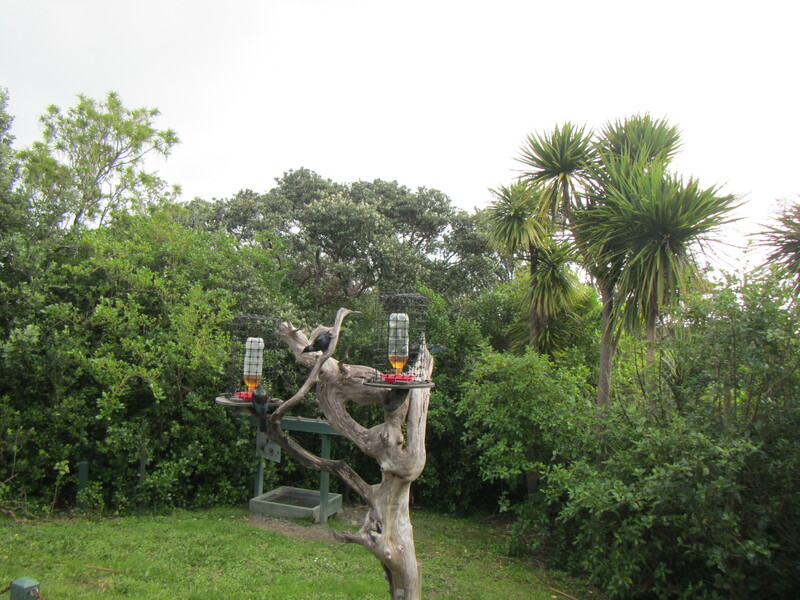 The volunteers have set up various viewing experiences to better show off bird behavior, such as the tui feeding station near the visitor’s center. I am not an avid birder and even I caught the enthusiasm of our guides and strained to hear and see birds. Binoculars are a terrific idea. Our guide Trish did a super job of explaining the history of Tiri. This video clip explains it best. We finished our guided walk at the lighthouse and visitor center. There is free coffee and tea at the visitor center and picnic benches both indoor and out. By this time we had hiked a couple of hours and the wind had really kicked it up a couple of notches. There is a gift shop and I did make some “additional donations” to the restoration effort. A kind volunteer put my name on my shopping bag and brought it to the boat launch at the end of the day (like duty free without the alcohol). There is something so soothing and lovely about a walk in the bush. The best way to experience is through photos. I love the tui bird so I was thrilled to see so many at once! For a variety of reasons I try to go to the Auckland War Memorial Museum (AM) whenever I am in Auckland. 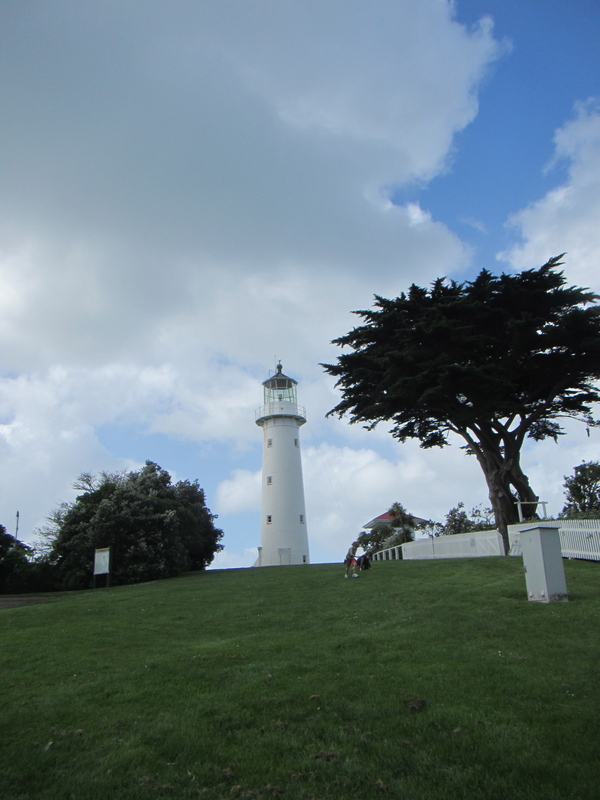 Located in the beautiful domain with an amazing view of the city and the bay, it is a little bit war memorial, a little bit natural history museum AND has a terrific gift shop. Seriously, if you are looking for good gifts from NZ, shop here first. 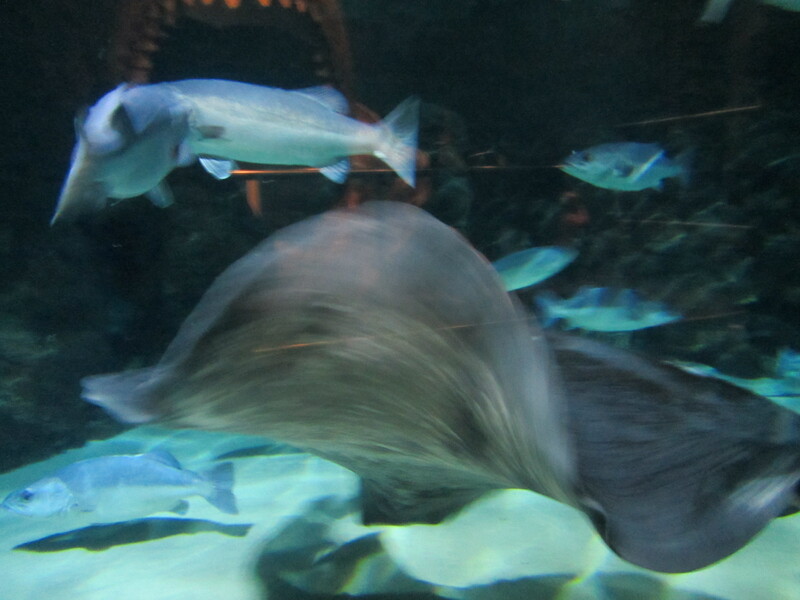 On this visit, I enjoyed the special, limited time Moana–My Ocean exhibit. This was developed from research AM scientists have been collaborating on in the Hauraki Gulf. 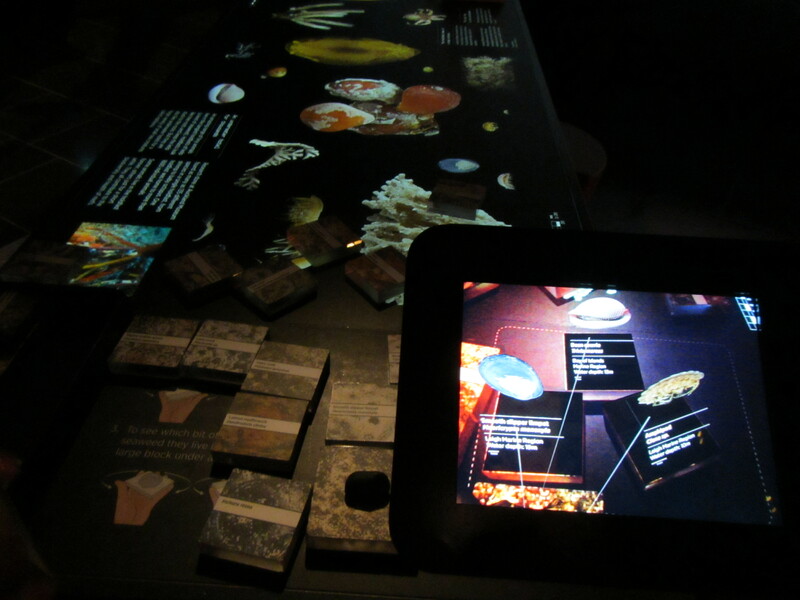 There were several parts of the exhibit using technology I have never seen before–especially the Boil Up. This uses artificial intelligence to create a new experience each time that allows you to experience a fish boil up and how it adapts to predators of increasing sizes. I also loved the special exhibit on Sir Edmund Hillary, and the permanent volcano exhibit. Dunedin is one of the few places in New Zealand guide books where penguin experiences are specifically called out, so I was a bit mystified that it was such a challenge to arrange. 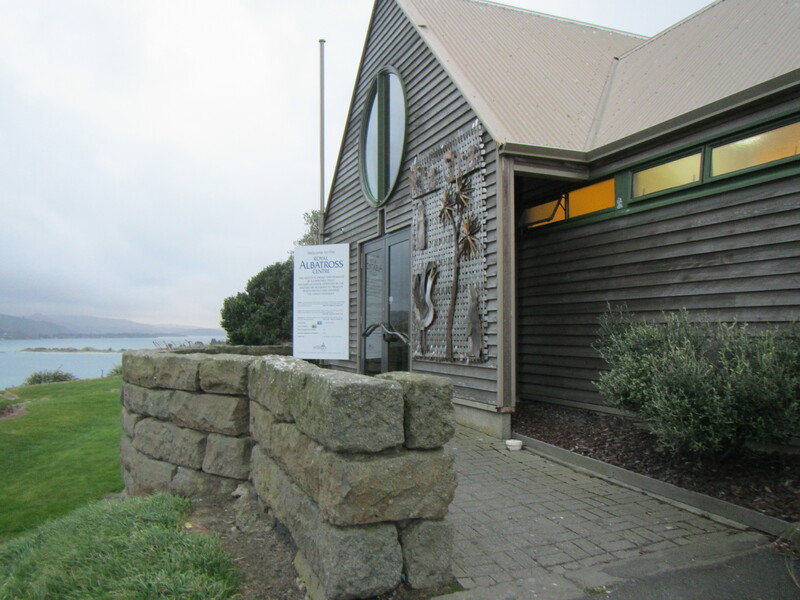 I was not able to arrange a yellow-eyed penguin tour so I signed up for Blue Penguins Pukekura at the Royal Albatross Centre. 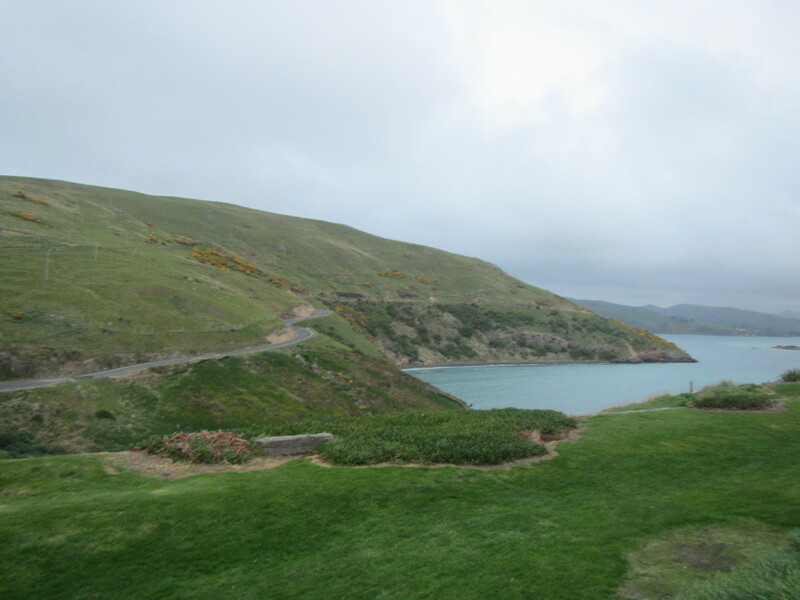 The drive on the Otago Peninsula Low Road was an adventure. Even though I had a firm grip on the wheel part of me had to smile at the “at your own risk” road. Not a great place to be in a storm unless you have a life jacket in the car. Also, stay sober! Driving all the way to the end to the Royal Albatross Centre is worth it. The Centre is interesting and I recommend arriving an hour before sunset so you can watch the albatross arrive to their roosting area for the night. (There is also a cafe to grab a bite to eat or hot drink). This particular evening the blue penguin viewing started at 6:30 p.m. Thumbs up for the jackets provided as an extra barrier against the cold and for the Maori welcome. The stairs are also well lit to the platform at the bottom of a gentle beach along the harbor. Unfortunately, this is not a wheelchair accessible experience. The sandy beach was easily visible from the viewing platform and we only had to wait a short while before the first raft of penguins arrived. 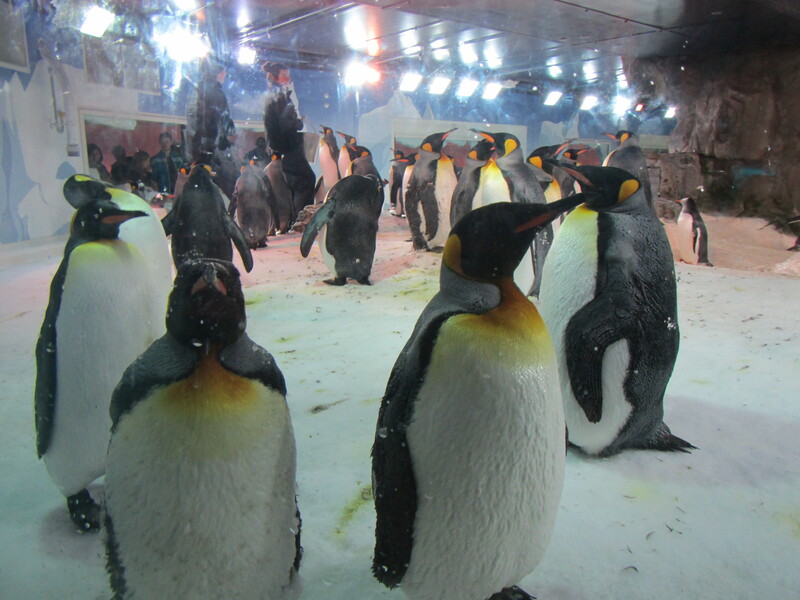 Because of the gentle approach, the penguins could assemble in the bay and arrived on shore together. About 100 yards off shore we could see their dark shape and the thrashing water signal their approach. Nothing however prepared me for their burst on to shore and sprint to the grassy area about 15 yards beyond the surf. It was so charming and funny. They are adorable. Again flash photography is prohibited. Everyone was in a super good mood by the time we started the steep climb up the hill. We handed our jackets over and began the “fun” drive back the coast road. It was actually not as worrisome as I expected. The next day I serendipitously discovered the office of the Yellow-Eyed Penguin Trust on Lower Stuart Street. They are celebrating their 25th anniversary of restoring habitat, funding research, and promoting penguin appreciation and education. I have seen other communities celebrate an individual (Rio Vista humpback whale Humphrey, Dingle dolphin, and of course the Loch Ness monster! 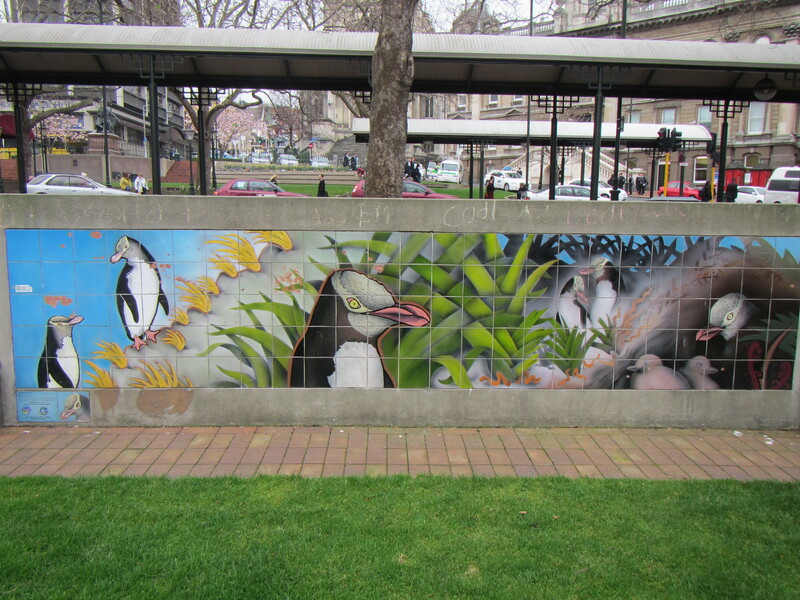 ), yet I found it sweet how Dunedin and the Otago region embraced their special stewardship of the yellow-eyed penguin. Dunedin is sometimes referred to the Edinburgh of New Zealand because of its Scottish roots. It is also a university town, with most NZ doctors trained at the medical college here. It seems redundant to say it is a beautiful location as everywhere in New Zealand is in different ways. I really enjoyed the central business district with the interesting railway station and the Octogon in the center of town. 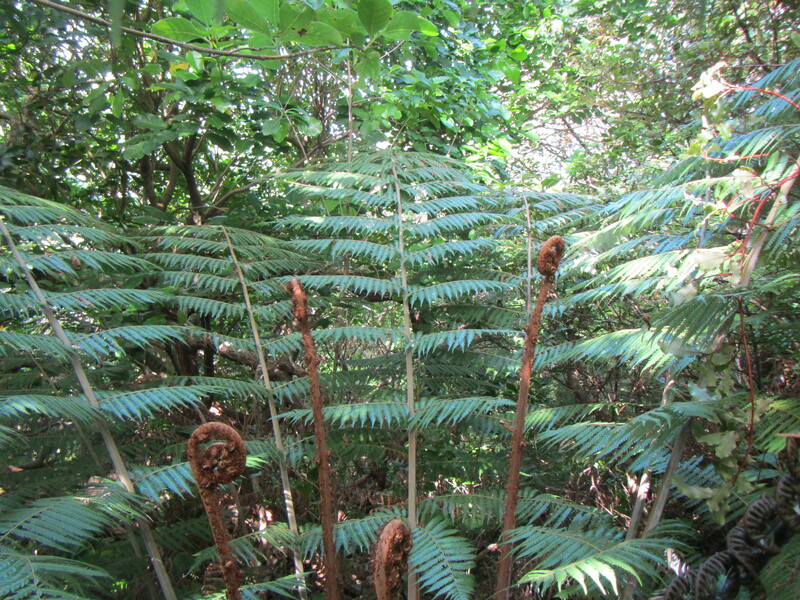 Dunedin is also one of many cities in NZ that prides itself on its gardens (Christchurch, Wellington to name others). 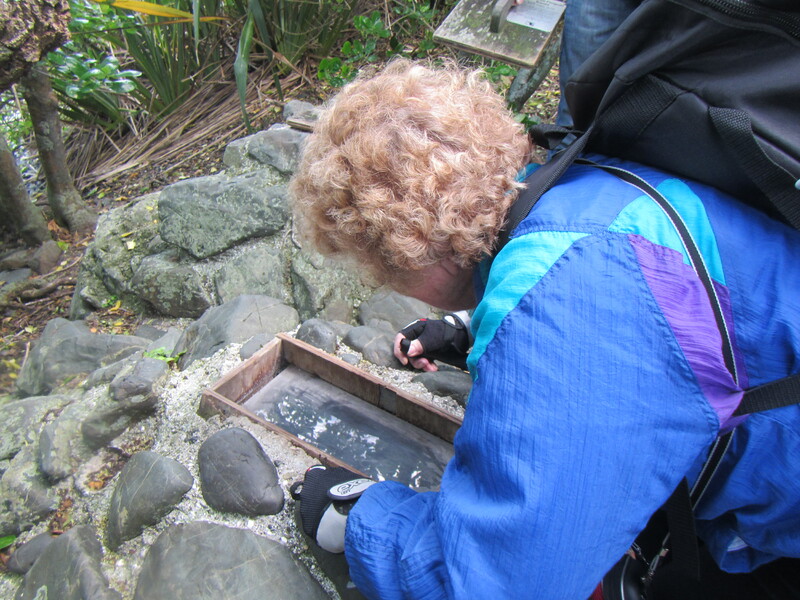 My main purpose was to see the penguins but if it had not poured rain I would have also gone to the Dunedin Botanic Garden or the more recently planted Dunedin Chinese Garden. 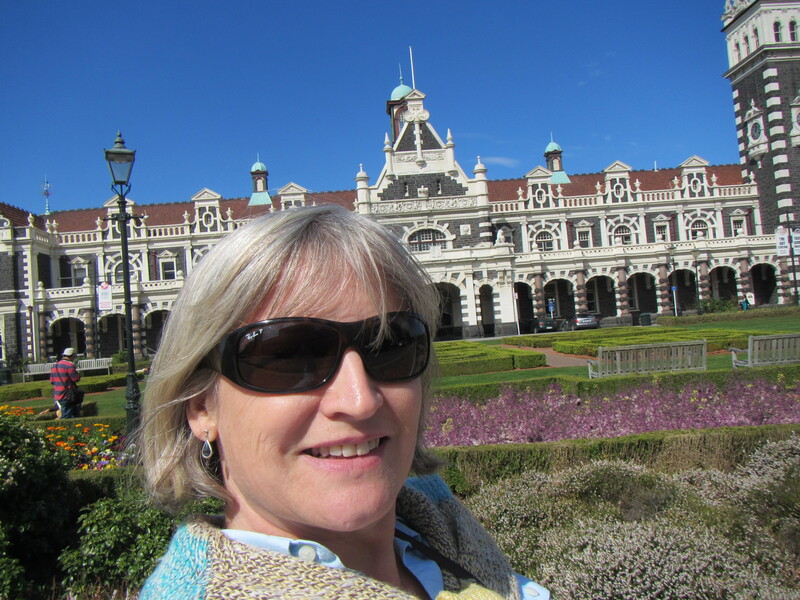 There also was not time to go to the only castle in NZ–Larnach Castle and gardens. All give me reasons to return. New Zealanders are also known for their love of sports of all sorts. Rugby is king, and Dunedin’s skyline is dominated in the harbor area by Forsyth Barr Stadium, built for the 2011 Rugby World Cup. The All Blacks beat the Springboks (South Africa) in Auckland on September 14, as part of the Investec Rugby Championship and they were facing Argentina in a few days in La Plata. The sports commentators were buzzing about this and that to do with rugby, but the eyes of the nation were firmly fixed on the America’s Cup. When I arrived in Auckland the race was being broadcast on every television in the Auckland airport. I had already been “educated” by Kiwis on my flight who were returning from watching the race in San Francisco. I already knew that the average Kiwi was way more passionate about the race than 10 Americans put together. And I learned quickly not to argue with people who clearly knew way more about the competition and sailing than I will ever know. So I asked questions like, “Oh, how did the American’s cheat?” When I commented that I hope the Cup returns to NZ so I can watch it in Auckland, they would nod vigorously and launch into a detailed explanation of how NZ will change the rules to make it more competitive. As one fan pointed out to me, when they hosted the America’s Cup in 2003 there were many more nations participating and some women-only teams. By the time I arrived in Dunedin (after my time in Oamaru) the American team had roared back to tie up the series and there was just one race left–sudden death. Bad time to be “American Julie” in New Zealand. 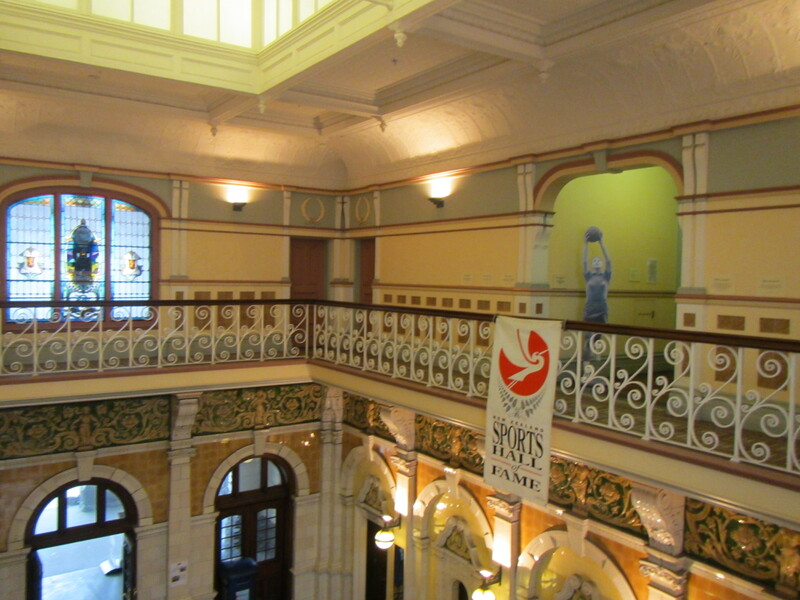 Coincidentally I decided to see if the railway station was as lovely inside as it is outside and stumbled upon the New Zealand Sports Hall of Fame. (It is.) The admission is just $5NZ, and the friendly older gentleman who was at reception was enthusiastic about all sports. For a country of 4.4 million, they have a remarkable number of world-class athletes. You might think the Hall of Fame is dominated by rugby, actually, there are terrific athletes in a wide variety of sports, including sailing. There were several handouts provided including one confirming that the All Blacks got their name from their “sable and unrelieved costume” as early as 1893. And they have performed the pre-match haka as early as 1888, but did not become a ritual until the first World Cup in 1987. My host pointed out that the Americans had done a remarkable job recovering from the NZ team’s 8-1 lead in the America’s Cup and I could feel the sting in his voice. So later when I saw a list at the exhibit for Sir Edmund Hillary of the most important sportsman of the 20th Century (as voted by American sportswriters), and I saw that the great mountaineer and inductee was 9th, and I saw that Lance Armstrong was 2nd, I crossed out Lance’s name and showed him that Hillary was actually 8th. We had a lovely chat about sports and sportsmanship. It made me think about the sporting paradoxes in the USA: we love an underdog, and everyone loves to hate a team (like the Yankees) when we feel that they “bought” their championships, and yet, people are lined up to buy a team and spend billions to have a championship too. We have many gracious sportsmen/women, and we tend to forgive some very bad behavior, like John McEnroe and Tiger Woods because of their sports prowess. And we tend to turn a blind eye to cheating if everyone is making money, and then express outrage when the person gets caught. As much fun as I was having, I had a date with penguins that evening, so I drove to the Hotel St. Clair in the beach suburb St. Clair. I found it on Trip Advisor and this hotel property is terrific. My room had a great view of the sea and a television. In the morning I was able to watch the final America’s Cup race at 9 a.m. before checking out. If you saw the race then you know that after the first turn the result was never in doubt. The NZ sports announcers grumbled a fair bit about the technological advantage and about “Herbie” the hydraulic system that helped the Oracle boat get on its foils more quickly. (I read later that this was greatly exaggerated.) As the American team celebrated their victory, one announcer made a snarky comment that since Brit Ben Ainslie was on the team, Britain would no doubt say they won. I expected people to be disappointed and Kiwis were really demoralized. They would hear my accent and they would congratulate me on the American team’s win. I realized from previous conversations that it did not help to point out that people in the US were not nearly as caught up in the America’s Cup as they are in NZ. I had my own “shock and awe” at how much faster the American boat was in the last 9 races, so I nodded when they talked about the technological advantage. I also tried to point out that there were Kiwis on every team, so really they could not lose, but that fell on deaf ears. One woman I met was still holding her “lucky bear” she got when New Zealand won the cup in 1995. She was near tears when she talked about the loss earlier in the day. On Friday when I walked with the American women, one of them shared that she read in the paper that psychologists are concerned that Kiwis over-identify with sports teams confusing their own self-esteem with how well their team plays. Hey, I used to be on that emotional roller coaster when I followed USC’s football team more closely. In a country where most of the population lives very close to the sea, and most people have a rudimentary understanding of sailing, and a heritage of sailing (whether you harken to the amazing Polynesian/Maori traditions or the British Navy), so sailing is probably always going to matter more to most New Zealanders. I was glad when I got to Auckland that people were recovering and celebrating the achievement of fielding a terrific team and coming close to winning. There was mostly praise for the Captain Baaaahker (Barker with a NZ accent). The Auckland Museum honored the team by lighting the museum with their team colors for 3 consecutive nights. And hundreds of people greeted the team at the airport. The New Zealand Herald is still covering the post-race “news”, but the All Blacks win over the Pumas in Argentina helped to soothe the national psyche.